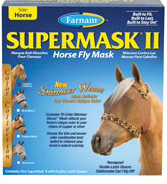 Super Mask® II Fly Mask protects eyes from fly irritation, disease, flying dust, dirt & debris. dirt & debris. Soft, sewn-in mesh ears allow the horse's ears to move while protected. Speeds healing after eye injury and provides UV protection. Built to Fit, Built to Last, Built to Stay On!